When it comes to keeping law and order, San Pedro has been lucky to have an able leading authority to fight the battle against crime - Assistant Superintendent of Police Rudolph Orio. Mr. Orio was born in Orange Walk Town on July 27th, 1953. He attended St. Peter's Anglican Primary School and in the 60's his parents moved to Belize City. He was enrolled at St. Mary's Primary School and then in the late 60's attended King's Bible College located at the Old Northern Road. Since his childhood, he was interested in detective work. His call was answered in 1971 when the intake of new recruits for the Police Training School was announced. He immediately jumped at the chance and joined the school near Ladyville. The entire course lasted six months. In November of that same year he graduated and started as a rookie in the force patrolling the streets of Belize City. He was recruited by the Special Branch of the Belize Police Force to work closely with the British Army gathering intelligence. In 1979, after working for ten years with the Crimes Investigation Branch (CIB), Mr. Orio was promoted to corporal and transferred to San Ignacio. After one year he returned to Belize City to join the Traffic Department where he worked in the patrol section for two years. Mr. Orio then moved to Belmopan where he kept order for two years. He first came to San Pedro in 1985 as a sergeant and worked with two other police officers. He stayed in San Pedro for three years. In 1987 he was promoted to Assistant Inspector and at the same time attended his first overseas course in Wakefield, England where he stayed for three months. He also attended another course in Barbados. In 1992 Mr. Orio returned to Belmopan and San Ignacio and took charge. This was the same time he was promoted to full Inspector. As destiny would have it, Inspector Orio was again transferred to San Pedro in 1993 for two years. After that he traveled to Jamaica for further training and upon his return, worked in the Uniform Branch in Belize City. In 1996 he was promoted to Assistant Superintendent of Police (ASP) and held the position of Officer in Charge for the CIB for a period of eight months and then Rural Executive Officer in charge of mainland substations. On July 30th, 1998 ASP Orio returned to San Pedro as Coastal Executive Officer. Since that time he is the maximum authority on the island, working closely with his department in keeping crime at a minimum. 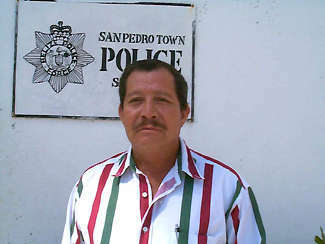 ASP Orio has since seen many changes in San Pedro and commented, "There is a vast change in the generation in San Pedro. Having worked here before, one of the most common things I can point out is the minimal parental control over children and the mentality of the kids here are those of rich American/Mexicans. This is basically caused by the parents who give too much money to them. Another difference is the increase in drugs on the island. Alcohol is a problem based from culture." ASP Orio's work has not gone unnoticed. He has received the Commissioner 's commendations accompanied by monetary awards. His goal is to one day become the Commissioner of Police in this country. That, he says would be his biggest achievement. He is happy with the community involvement and support towards the police force in San Pedro. Recently the police and citizens have commenced neighborhood watch programs, and the Police Citizens Advisory Committee is helping a lot. He continued, "The public is becoming aware of crime and drugs and are supporting the police department 100%." He plans to stay in San Pedro for a while and future plans include working with parents and teachers on awareness of the sexual/child abuse that is presently being experienced countrywide. ASP Orio and the San Pedro Police Department work diligently everyday to decrease crime on our island and look after the welfare of the visitors and locals. Our community can rest calmly knowing that ASP Orio and his staff secure the order in San Pedro.